New food truck concept brings Hawaiian-inspired ‘cool’ to Toronto street foodTORONTO, ON – While Toronto may be lacking in coastal surfing, luaus and leis, Sweet Snow Shave Ice is bringing a taste of Hawaii to the city this summer. Not to be mistaken for a snow cone, shave ice is a fresh, icy treat more akin to sweetened snow than chunks of syrupy ice. Sweet Snow Shave Ice hits the streets this July and is also available for private and corporate functions.Owners Jessie Frampton and Rob Brunner discovered the frosty island staple on one of their many surfing trips to the Aloha State. Taking note of the city’s blossoming food truck culture, they decided to bring their beloved sweet treat to Toronto with its first-ever shave ice food truck. “I’ve been surfing in Hawaii for years and no trip was ever complete without a shave ice. It was definitely love at first bite for me, and for Jessie too,” said Brunner. “With Toronto’s hot, sweaty summers, we realized our vacation staple would be a welcome way to beat the city heat. Trust me when I say that shave ice satisfies like nothing else.”Unlike snow cones, which use crushed ice and often result in a leaking, soggy puddle of artificially-flavoured syrup, Sweet Snow Shave Ice uses a machine that literally shaves a block of ice to create light, fluffy snow. The airy snow is packed into a cup and topped with homemade fruit flavours, sweetened with natural ingredients like organic cane sugar and pure agave nectar. Sweet Snow Shave Ice offers 25 flavour selections, including coconut, lychee, green tea and watermelon, and fun flavours like root beer and cotton candy. Guests can combine up to three flavours or choose one of the signature Sweet Snow Blends, such as The Hawaiian (pineapple, coconut and banana) orBerries Gone Bananas (banana, wild berry and strawberry). With two sizes to choose from (small $3.50 and large $4.50), Sweet Snow Shave Ice also offers a variety of add-ons to take the treat to the next level. Order it Stacked(served over vanilla ice cream, $1 or add sweet and chewy Adzuki Beans, $0.50),Capped (drizzled with cool and creamy condensed milk, $0.25) or Packed (the works, includes all the above, $5 for small and $6 for large). The wide variety of flavour combinations will have Torontonians feel like they’re hanging ten instead of working the nine-to-five grind. The colourful, surf-themed food truck utilizes local vendors wherever possible and uses biodegradable containers and bamboo spoons to serve their sweet treats. 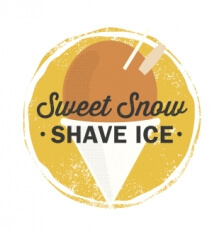 Sweet Snow Shave Ice hits the streets of Toronto this July and can be tracked by following Twitterand Facebook accounts. The truck is also available for private and corporate events, community functions and fundraisers.